Passport control: I went in July 2017, no passport or ID required to ride the train. But this may change anytime, please make sure you check beforehand. 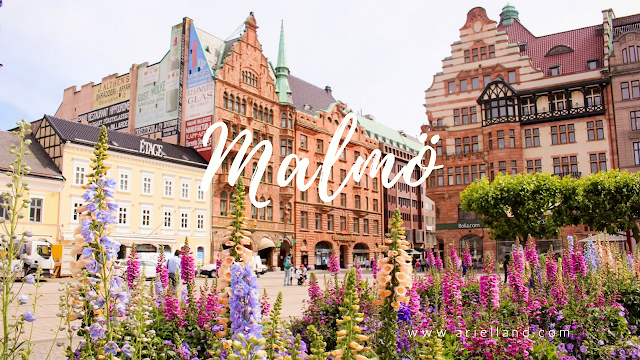 Prior to going to this trip, I never knew about Malmö until a Welsh friend told me about it. Malmö is a Swedish city just 40 minutes by train from Copenhagen. You can purchase the tickets at Central Copenhagen station prior to boarding easily. The tickets cost around 88 Danish Krone or 111 Swedish Krona (€11.70). My mother and I were freaking about not having our passports with us when we boarded the train, but they never checked. From what I know, they introduced passport control but then cancelled again. I’m not sure if they will bring it back, but always check before traveling! It’s easy to get comfortable with traveling around Europe and forgetting that there are actually borders. We grabbed some late breakfast at 7-11 and head for the train. It was a very comfortable ride straight to Sweden, and the weather was just amazing - low 20C and sunny! The Malmö train station was very modern with a lot of lovely shops, and you can also easily change for Swedish Krona there. We exited out South of the station to head west towards Malmö castle. But wow, the view was so beautiful. The buildings looked perfectly designed, what you think Scandinavia Europe would look like. What I also noticed about Malmö is their love for plants and flowers, which nicely compliments the city’s buildings. The color just pops out, and everything is aesthetically really pleasant. We walked along the Canal just outside of the station. Adding onto what I said about Scandanavia’s trust system in people using public transport in my previous blog post about Denmark, Malmö has self-serviced automatic canal boats! This would never happen in Asia. You download an app and order your boat. You can pick it up at any place on the canal and drop it off anywhere. Just scan the app on the device by the boat to undock it and then you can ride it up and down the canal. I didn’t know this prior to coming to Malmö, so I didn’t have the app to ride the boat. Maybe next time! Nonetheless, the walk from the Station to Malmö castle along the canal was really lovely. There was Lavender along the way, and just rows of beautiful buildings. After around 10-15minutes, we arrived at Malmö castle. Malmö Castle is a fortified castle and a strong hold for the Danish kingdom. The Art Museum takes you back in time to see what people wore, how they lived, and also conditions of the many migrants and prisoners at the time. The museum did one thing very well – sound effects. It is more powerful than you think, and I fully support museums to do this more as the visitors can be more immersed in the experience. This square is a must visit if you are in Malmö. I can’t quite describe it… the buildings in Copenhagen doesn’t have quite the same color walls or the shape of buildings. So Malmö definitely has its own look. The best thing is that they had really beautiful and colorful pots of flowers along the square. With the flowers and buildings in the background, it’s needless to say that the photos all come out amazing. St.Peters Church is right nearby the square. I wasn't planning on seeing this place, but we had some time so we wandered in. It was pretty quiet and nicely decorated inside. If you're by the square, then definitely pop in and check it out! We walked a long way down to Spoonery restaurant to try to get some late lunch. This was recommended by a Swedish friend of mine. I wanted to try some local food, so it was worth the half hour walk. (I’ll just skip past the part where both my mother and I started b*tching about how long the walk is and that we should’ve taken a bus). But still, the walk was good so we could see what the neighborhoods look like. Spoonery is on the corner of a street, and had lovely seating outside where the sun shone. They had 7 simple dishes we could order from but it was all written in Swedish. Luckily the guy working at the counter was Taiwanese origin and spoke some English and Chinese, so he was able to help with our orders. After a long walk, beers were a must, so x2 beers. I went for a Meatball dish, my mother went for Salmon and Shrimp Stew, and we could also help ourselves with bread and butter. All in all, we were in Malmö for a short afternoon trip, but it was a very pleasant one, and I’m also really happy to get to see a little bit of Sweden. I would definitely highly recommend it to anyone going to Copenhagen! You can easily go around noon, walk around and return by late afternoon. Next up, I’m back in London! Yet for another 24 hours. I’ll be tackling 3 of the major museums in London as well as Portobello market. But if you haven’t yet, also check out the first 24 hours in London post here. There’s a few hidden gems and less known places you can plan a visit to. I felt like I am there with you and visiting all those places.The way you have taken pictures of the wonderful places that you have visited.